Legrandite is a rare zinc arsenate mineral, Zn2(AsO4)(OH)·(H2O). It is a mineral consisting of a hydrous basic arsenate of zinc. It is a rare and beautiful mineral that is a favorite of mineral collectors. It is an uncommon mineral that occurs in oxidized zinc-arsenic bearing deposits and can be found, albeit rarely, in granite pegmatites. It was first described in 1934 for an occurrence in the Flor de Peña Mine, Nuevo León, Mexico and named after M. Legrand, a Belgian mining engineer. It is known worldwide from the famous localities around Mapimi, Mexico. Localities for Legrandite include in Mexico, Namibia, the United States, Japan, and Brazil. Crystal class: Prismatic (2/m) (same H-M symbol). 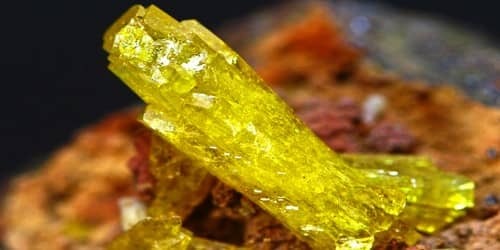 Legrandite is a vitreous mineral that seems to radiate its unusually rich yellow color. 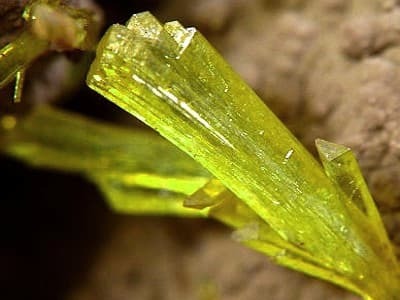 No other mineral is associated with limonite that has a bright yellow color with prismatic crystals and therefore legrandite is pretty easy to identify. However, it is rare and not so easy to find. Good specimens are hoarded by the collectors who are lucky enough to find them. Occurrence: An uncommon secondary mineral in the oxidized zone of Zn–As-bearing deposits; rare in granite pegmatite. It has been reported from Tsumeb, Namibia; the Ojuela mine in Durango, Mexico and at Sterling Hill, New Jersey, US. Association: Adamite, paradamite, k¨ottigite, scorodite, smithsonite (Ojuela mine, Mexico); leiteite, smithsonite, reni´erite (Tsumeb, Namibia); k¨ottigite, adamite, pharmacosiderite, scorodite (Sterling Hill, New Jersey, USA).